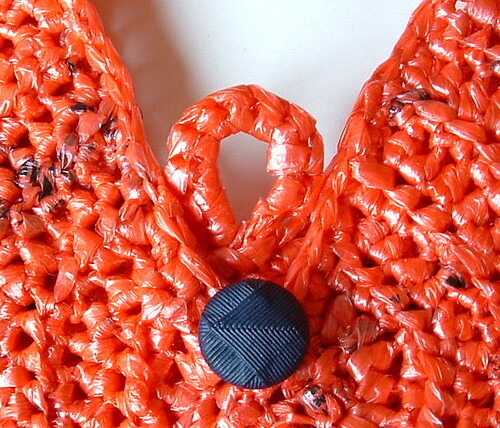 I call my latest recycled bag A Slice of Plarn. 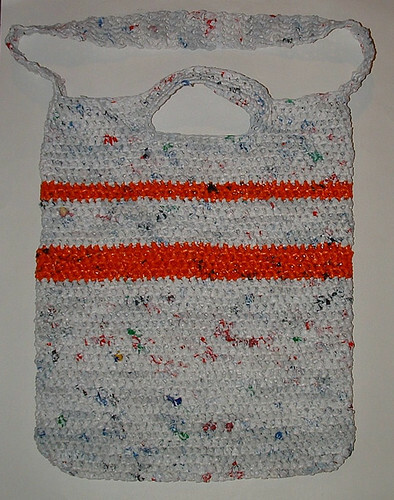 It is crocheted using salmon colored plastic newspaper bags. The finished purse looks like a slice of tangerine or orange to me and therefore this is how this plastic bag project got its name. 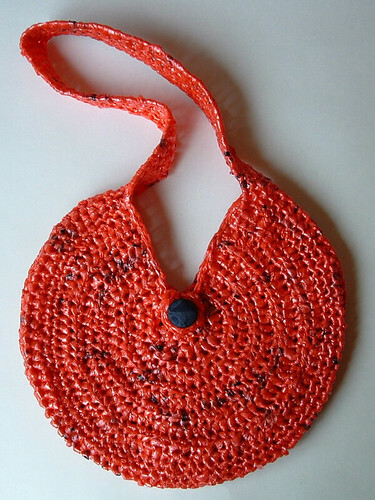 The pattern I used is for a crocheted hobo bag that is available free over at Crochetspot blog site. I adapted the pattern just a bit to allow for the difference between using plastic bag yarn and regular yarn. I worked the pattern in half double crochet stitch rather than double crochet. I also worked a row of single crochet along the inside wedge edges just to give it a smoother finished. My finished bag is 9 inches tall and about 10 inches wide. I worked just single crochet stitches on the strap to provide a stronger strap so the plastic wouldn’t stretch too much when the purse is used. My button loop includes another round of single crochet around the basic chain that the original pattern calls for. Again because I was working with plarn, I felt that my loop need the extra round of stitching to make a secure closure. For all those log cabin pattern lovers out there, here is my version of a log cabin potholder. 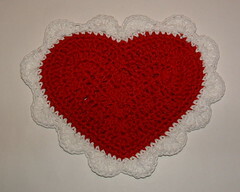 This potholder or hotpad was crocheted using scraps of cotton yarn I had on hand. I have also been saving all my juice and milk jug rings for crafting projects. This plastic ring is a larger one that I recycled from an apple jug. Using these recycled rings saves you from having to purchase store bought rings for your potholder projects. 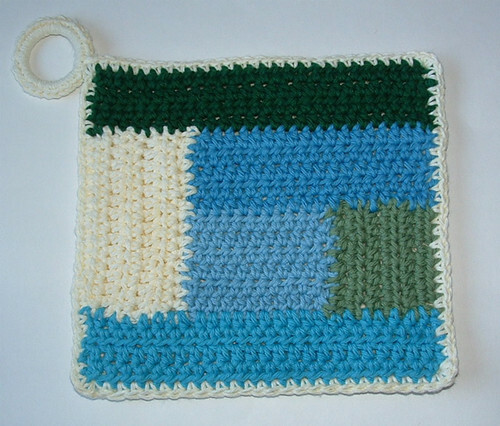 The potholder or hotpad completes my set that includes the log cabin scrap dishcloth pattern I posted last month. These items are an excellent way to use scraps of cotton that you may have been saving and not sure what could be done with the small bits. My pattern is written with specific colors listed but you can mix and match the colors depending on what you may have on hand. As always, please enjoy the free crochet pattern below. This week I present a dual handled plarn tote bag. A reader recently asked if I had a free pattern for not only a shoulder strap but also a bag with handles to grip with your hands. So I got busy and crocheted this tote bag for her. It’s like the best of both worlds — You can throw this jumbo tote bag over your shoulder or grasp it by the smaller handles. This is another over-sized tote bag project that is similar to my jumbo plarn beach bag which features one long shoulder strap that has a pull through front closure. I think this tote bag would make an excellent farmer’s market bag as you have so much room inside and the two different ways to carry it around. So whether you want one long strap or dual handles on your plarn tote bag, you can mix and match these two free crochet patterns that I am posting at my blog. Best wishes and happy crafting to all!